Need a fast appraisal in or around Maricopa County that is reliable? We strive to provide fast and efficient services for our clients, and as part of that commitment we've embraced mobile technology. By using mobile devices out in the field, we've eliminated the cumbersome paper and clipboard, meaning faster and more reliable appraisals for you. Traditional appraising involves going to the jobsite and collecting large amounts of data including an accurate sketch using paper, pen, tape measure, and clipboard. From there, you still have to manually type that data into the computer at your office, which can lead to errors. Many appraisers still use this error-prone, time-consuming method today. Being a mobile appraiser means we no longer have to worry about carrying unnecessary equipment. Through an easy-to-use device, the information is uploaded straight to the office without ever having to enter in that information again, meaning a faster turnaround time for you. 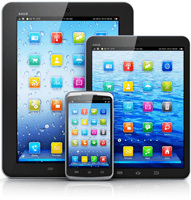 Need to contact a mobile appraiser? Call us today at 602-405-2233. Through the syncing process, we're able to seamlessly access data from our devices in the field. New data can then be entered, making the data on the form up-to-date. With the use of laser measurers, we are able to gather pinpoint measurements with our devices. As a perk, we're always ready to answer questions when you call or e-mail us. Mobile appraising makes us much more efficient, giving us with the forms and information we need at all times so we can concentrate on appraising.